One by one, BYU football players -- dressed in blue and white team gear -- filed onto a bus outside the Holiday Inn Express in Orem, Utah, last Friday night. It was just after 6 on the eve of the Cougars' annual grudge match against Utah, but instead of watching film or making last-minute preparations, the team was headed to the Promontory Correction Facility in nearby Draper to speak to inmates in the prison's Substance Abuse Treatment Program. With everyone aboard, a team official scanned his clipboard and gave the driver the go signal. But just before the door closed, a burly 6-foot-1, 227-pound linebacker wearing a baseball cap backward and a dark sweatsuit got on board, ducked into an empty seat up front, put his elbows on his knees and buried his face in his hands. As the bus pulled away, BYU players were shocked to see Spencer Hadley. Earlier in the week Hadley had been suspended from the team for five games for violating BYU's honor code after an email alleging Hadley had been partying in Las Vegas was sent by a Utah fan to the University of Utah and was forwarded to BYU (a photo of Hadley in Las Vegas later surfaced and went viral). Cougars coach Bronco Mendenhall didn't address the specifics of the suspension, but the fact that it was Holy War week between BYU and Utah only magnified the situation in the local media. Hadley later denied receiving extra benefits, but he admitted to partying in Vegas and drinking alcohol, which even though he's 23 is a violation of BYU's honor code and got him suspended. As he rode with his teammates to the prison, Hadley was too emotional to think about football and felt he let his team -- and himself -- down. "I wasn't sure I wanted to be around the team," Hadley said. "I felt the shame of what had happened." But a BYU assistant coach kept encouraging Hadley to join the team on the trip to the prison. Hadley decided to drive to the Holiday Inn, but even when he pulled into the hotel parking lot he was having second thoughts. So he texted his coach. "You should get on the bus," the coach texted back. It wasn't until Hadley was inside the prison with his teammates that he knew he had done the right thing. Roughly 100 inmates in green and white jumpsuits sat in chairs in a small gymnasium. The team filed into three rows of chairs that were behind a lectern facing the inmates. Prison officials occupied the front row and armed guards were stationed around the room. Hadley listened as two of his teammates addressed the audience, then a group of BYU players sang a Christian hymn. Coach Mendenhall then delivered the keynote address and took questions from the inmates. The last inmate to raise his hand told Mendenhall that they'd all be tuning into the game the following night. Mendenhall thanked them and turned to sit down. Before he reached his seat an inmate in the back shouted: "Put Hadley in." The room went dead quiet. Mendenhall pivoted and looked at Hadley, who met his gaze. "Do you want to say something?" Mendenhall mouthed. "Do you want me to?" Hadley mouthed back. Mendenhall nodded. Hadley stood and joined his head coach in front of the lectern. "Spencer has made some mistakes recently," Mendenhall said. "He's going through a tough time. I'm not going to say anything more. I'll let him tell you the rest." Alone, Hadley folded his arms across his chest, hunched his shoulders and lowered his head. Every inmate's eyes were locked in on Hadley. After a long silence, he cleared his throat and shared a scripture about vile sinners that had been forgiven by Christ. "I've done some things that have embarrassed my family, my teammates, my school and even my church," he said. "But I believe in redemption." "I know who I am," Hadley continued. "I know who you are. We're all children of a Heavenly Father. All of us in this room have made mistakes. Not one of us qualifies as being the vilest of sinners. Yet having made mistakes I know that we can change and we can come back and right the wrongs that we've done." As he spoke, most of the hardened inmates wiped tears from their eyes. During their incarceration they had heard their share of speeches from outside visitors. But on this September night a suspended college football player had reached them and touched their hearts. One inmate rose to his feet and started clapping. A second inmate joined him. A third stood up. Soon every inmate was on his feet, shouting and clapping. Mendenhall stood and wrapped his arms around Hadley, who buried his face in his coach's shoulder and wept like a baby. "I'm proud of you," Mendenhall whispered. "The first step on the road to redemption is to use our mistakes to bless others. And that's what you did tonight." By this point even the prison officials and armed guards were wiping tears from their eyes. Chants of "BYU! BYU! BYU!" echoed off the prison's concrete walls. It was louder than the roar inside the stadium on a Saturday afternoon. As Hadley exited the prison, the wife of one of the prison's senior officials pulled him aside. "You gave these men a gift today," she said. Then her voice trailed off and she broke down. Spencer Hadley grew up on a dairy farm in eastern Washington. One of eight children, he spent his childhood working alongside his father, Alan, who had 1,500 head of cattle. At an early age Spencer learned to bottle feed 200 calves a day. As a teenager he branded and dehorned cows, castrated calves and mended fences. "I loved doing that stuff," Hadley said. "There was something honest about coming home tired, dirty and sweaty." The only thing Hadley enjoyed more than working on the family ranch was football. An Eagle Scout with a 3.95 GPA, he was heavily recruited to play football by Harvard, Yale, Princeton, Columbia and Stanford. But from the time Hadley was a little boy, he had dreamt of playing for BYU. As a devoted Mormon, nothing, he figured, would make his dad more proud. So the minute Mendenhall offered him a scholarship, Hadley committed to the Cougars. After his freshman season, Hadley left on a two-year mission in Sacramento. He spent much of his time trying to lift and encourage people who were struggling with guilt brought on by personal failings and human error. "We are all our own worst critics," Hadley said. "As a missionary I constantly told people there is nothing we can do that isn't redeemable. You're never too far gone. There is no single mistake that can't be overcome through the Savior. You always have a fighting chance." After his mission, Hadley returned to the team in 2011 and won a starting position as a linebacker. Last season he made 55 tackles, and this fall he teamed with All-America Kyle Van Noy to form one of the nation's top linebacking corps. BYU started the season 1-1 and Hadley was the heart and soul of the Cougars' defense before the report of him partying in Las Vegas surfaced. In his first three seasons, BYU had never beaten Utah, and there was nothing Hadley wanted more than to beat the Cougars' archrival as a senior. That dream was dashed with his suspension. 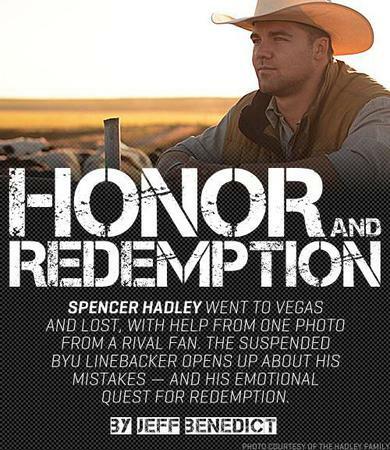 After his freshman year at BYU, Spencer Hadley spent two years serving on a mission in which he helped people try to overcome their mistakes. Heated rivalries are part of what makes college football so special, and the annual BYU-Utah clash has become one of the the nastiest, most personal rivalries in the nation. Last year while working on the book, The System: The Glory and Scandal of Big-Time College Football, I attended my first BYU-Utah game. At the time I had no intention of mentioning the game in the book, but the extreme profanity and vile abuse I witnessed that night caught me off guard. Utah fans spit on BYU players and taunted BYU fans by mocking the school's honor code. In one sense it reminded of the 1980s when the Notre Dame-Miami rivalry was cast as The Catholics versus The Convicts. But the BYU-Utah rivalry has a certain us-versus-them tone. Only it is Mormons versus Mormons. As a practicing Mormon who grew up on the East coast and has no connection to either school, I see this as yet another unfortunate example of how big-time college football causes people and institutions to lose perspective and forget priorities. Immediately after Utah's assistant AD Kate Charipar received the email about Hadley, she telephoned BYU's compliance officer Chad Gwilliam and read it to him. He then asked her to forward the email and any photographs. "If Chad had received something similar in nature about one of our players I believe he would have done the same thing to try to get the same information," Charipar said. "There is a rivalry out there between the fans. But within compliance there is phenomenal relationship between us. So it was an attempt to be benevolent to them." While BYU looked into the allegations that Hadley had been involved with an alleged booster, an assistant coach called Hadley and read him the entire email. "Please tell me this is not true," he said. Hadley responded, "Most of it's not true, but part of it is." All the alleged NCAA violations, Hadley said, were baseless. BYU verified that by checking out so-called booster Jacob Stocking. His name appeared in no BYU athletics databases. Turns out he's a family friend of Hadley. The family said that Stocking has never attended a BYU football game, much less supported the program financially. But claims that Hadley had partied with his friend in Vegas were true. He had gone to clubs and on more than one occasion consumed alcohol. The photo had been taken over the summer. The most recent trip to Vegas had happened during BYU's bye week following its victory over Texas. On his way home from the most recent getaway to Vegas, Hadley told his friend he would not be returning. "I came to the decision on my own that this is not who I am or what I'm about," Hadley said. "I didn't like the way I felt after leaving that place. So I had planned to talk to my coach about it and set the record straight. But the email came in before I got to him." Mendenhall had just one question for Hadley: why had he gone in the first place? "That was a hard question," Hadley said. "I told him, 'I don't know.' When I really think about it I don't know why I was there. I was curious, I guess." Mendenhall said that suspending Hadley was one of the hardest things he's ever done in his coaching career. "It's hard to think of a player I love more than Spencer," Mendenhall said. In any other big-time college football program -- including, most notably, Utah's -- Hadley's behavior would not have drawn a suspension. At 23 he's of legal age to drink. And there's no law against visiting a nightclub. But Mendenhall has a track record of holding players accountable when they violate the student honor code. In 2009 he made top recruit Kyle Van Noy sit out an entire season after he was cited for DUI during his senior year of high school in Reno, Nev. Four years later Van Noy is an All-America linebacker and is projected to be a first-round pick in next year's NFL draft. He credits Mendenhall for rescuing him. As soon as Van Noy heard that Hadley -- known by his teammates as "Duce" -- had been suspended, he texted him: "Duce, I love you kid. Haven't slept well since I heard the news. I know you haven't either. I just want to let you know I support you and have nothing but love. You're a good man. And I know that with all my heart. We all make bad decisions! Just know I stand by you through anything you do. Much love, KVN." A few hours before Saturday's 20-13 loss to Utah, Hadley sat with his parents in his apartment a few blocks from BYU's stadium. Alan and Kathryn Hadley had flown in from Washington hours after Spencer telephoned to tell them he'd been suspended. "For Spencer, beating Utah was the biggest thing," Kathryn said. "When he called me Monday he was very emotional and begging for forgiveness. He told me what he had done." She wiped away a tear and smiled. "We take the honor code seriously," she continued. "It is who we are. But honestly, if I was under a microscope during my early twenties and had my mistakes put on ESPN, it would be humiliating." The smile faded and she began to cry. Alan Hadley hugged his wife. "BYU's football team is different by nature of the school, church and honor code. The expectations are high. So a mistake that becomes so public just devastates us more than we might imagine." He soon lost his composure, too. "Will he be remembered as the boy who went to Vegas and lost it all?" Kathryn said. "Is that his legacy at BYU? Or will he be remembered as the boy who had courage and wanted to be redeemed?" Spencer looked at his parents, both in tears. "I love my mom and dad," he said. "I'm not sorry I got caught. I'm sorry because that's not who I want to be. I don't want that one moment in my life to define me." Jeff Benedict is co-author (along with Armen Keteyian) of a new book on college football, The System. Purchase a copy here.